If post-grunge and alternative metal is your kind of music, chances are you’ve heard of the band Seether. What you may not know, however, is this widely successful band hits closer to home than you may realize. Former OCCC business major and Oklahoma resident John Humphrey is currently living out his love for music as the current drummer for Seether. 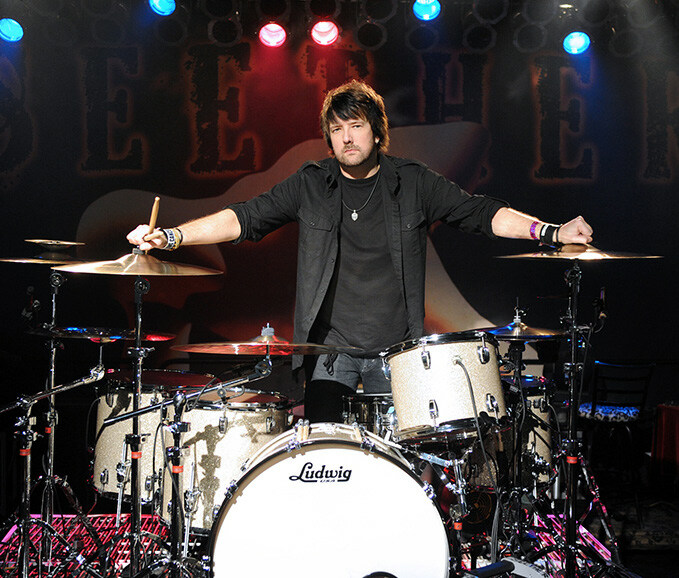 Now 42, Humphrey became the permanent drummer for Seether in 2003 after the South Africa-based group signed a record deal with Wind Up records and relocated to the U.S.
“I heard about [the band] through a mutual friend,” Humphrey said. “He knew they were having trouble finding a permanent drummer and suggested I audition. Before Seether, Humphrey was drummer for a semi-successful band from Oklahoma called The Nixons. Humphrey said he knew he had a passion for music early on. “I was always the strange little kid that really liked music,” Humphrey said. Humphrey said it took trying out different instruments including piano, which he labels as “misery,” before he found out drums were his calling. Humphrey received his first drum kit the following Christmas. While Humphrey was taught how to read music in school, he took his skills a step further by listening to other drummers, picking up on their nuances, and trying to mimic them. KISS, Van Halen, AC/DC, Buddy Rich and Ringo Starr are just a few of his influences. “I taught myself basically by ear,” he said. Humphrey’s first real gig at drums came in high school when he was hired to play for a college performance. Now Humphrey is getting to take his talent all across the globe. On average, the band does 250 plus shows a year in countries such as Russia, Portugal, Germany, Sweden, France, Italy, Canada and many more. “It’s pretty cool. My drums have literally taken me around the world,” Humphrey said. Broadcast major Nichole Shadid, who attended Seether’s performance at the Diamond Ballroom last month said she enjoys the atmosphere the band provides during its shows. Although he enjoys traveling to new places, Humphrey said the most meaningful shows to him are ones such as performing for USO troops on base. “We’ve played in Japan, Hawaii and Guam for USO troops, and we’ve played in Turkey to troops who were being deployed directly to the Middle East,” Humphrey said. When he is not touring, Humphrey is in full family man mode. With a wife and two boys, Humphrey said he enjoys taking his kids to school, sports practice, and even attending PTA meetings. Humphrey also said he is never hesitant to visit with fans. While at a visit to the doctor recently, Humphrey was approached by a man wanting an autograph for his daughter who happened to be a huge Seether fan. When asked by a nurse if he minded signing stuff for people, he answered, “I don’t mind it at all. “I’m very grateful for having this career and our success, and I have no problem signing an autograph, taking a picture, or talking to a fan,” Humphrey said. “Put the ego away. The ego can really damage and you won’t be called for that gig or you won’t have any opportunities. While the future in the music industry is never certain, Humphrey’s hope is simply that Seether will continue making music and touring. “Whether or not we have huge hits, that’s just the nature of the business. Sometimes you’re up and sometimes you’re down,” Humphrey said. “If people are coming to the shows and I can play the music and be in this band and do what I love doing, then that’s success to me.